Developers, and people who know and love every detail of Logitech Harmony Remotes, may find the fact that Logitech Revue has Harmony Link inside interesting. But what does that mean to the rest of us? Logitech Harmony® Link is an IR translator that uses the Logitech Harmony device library to look up how to control your home entertainment devices. This means that Logitech Revue can receive commands – through Wi-Fi, a software app or from a remote – and can (through Harmony Link) send out commands to other devices that understand IR (which is almost anything that uses a remote control, such as TVs and receivers). The reason Harmony Link is built into the Revue is so when you click on a show, a favorite or a command while using Google TV, the Logitech Revue can change stations and send the necessary controls to the other devices automatically – all from one controller. We knew it was critical to make the Logitech Revue and included Keyboard Controller function as one seamless system to be a great experience. The Keyboard Controller has controls for your HDTV, AV receiver and cable or satellite set-top box. So you can manually turn them on and off separately and use relevant, basic commands, like volume and channel. But the Keyboard Controller itself is not Harmony: there is no one-touch activity for “Watch Google TV”. Why? We quickly understood that a Keyboard Controller, although the most intuitive way for most people to search, is not going to replace the remote control in anyone’s living room. The Logitech Mini Controller (sold separately from Revue) functions in the same way – with separate power, volume and channel changing, and no one-touch activity. If you’ve used a Harmony remote before, you’re used to more powerful control. With that in mind, we developed a software based controller for the handheld screen we knew a lot of you already had—your smartphone. A free download allows your iPhone, iPod Touch, iPad or Android device to use the Harmony Link inside the Revue companion box. This means you can search, navigate and have basic control on your personal device, but you also have a “Watch Google TV” activity available. The Logitech Harmony® App only works when your entertainment system has Harmony Link—which is only available inside Logitech Revue. While our first priority was getting you the ideal Google TV experience, we’ve heard from Harmony fans that getting additional activities was something you want right away. We’re in development on the capability to add multiple activities. What protocol does it use? I read somewhere that it was an open protocol. Do this mean that we can create applications and integrate with Harmony Link? Google TV is built on the Android platform. I was asking about the Harmony Link protocol specifically. Will that be open so we can create our own applications based on Harmony Link to control our devices? It seems to be using some sort of XMPP, but correct me if I am wrong. I have a Revue and enjoying controlling it using the iPhone Harmony app. I have two questions – even though my Revue is NOT connected to the AVR – can I add the AVR so that I can control it? And also my PS3? My second major question – when will you guys come out with a native iPad app? 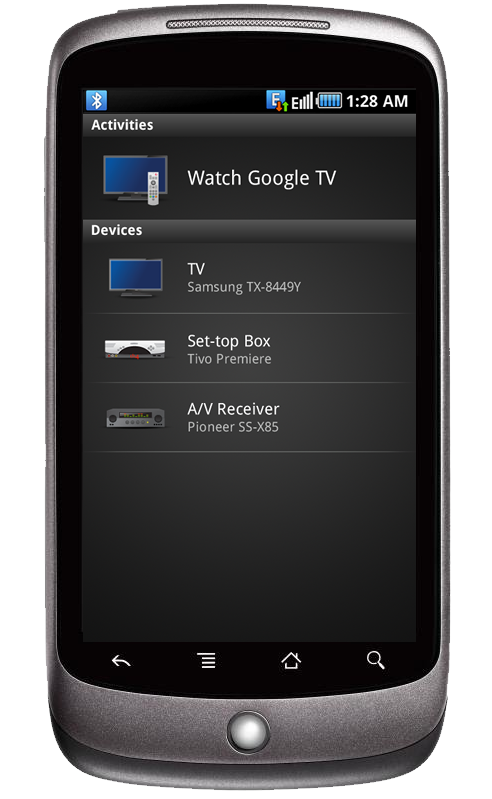 You could use the Harmony App for Google TV to control your AVR. However, since the Harmony App only interacts with devices related to Google TV, you can not control your PS3 from the app. Oh and for your second question, we can’t talk about future apps but thank you for your feedback and check back here for future updates and announcements. Thanks Ashish. GoogleTV on Revue has been my first exposure of using the Logitech Harmony technology. I am pretty impressed. And look forward to new iterations of the iPad/iPhone apps. I also look forward to having an iPad app that can make use of real estate to have all the functions of the AVR and STB on one screen instead of flicking and changing pages. Does that mean that the Harmony Link tech inside the Revue only controls GTV related devices? So, for example, I can’t use a smartphone to do a “Play Blu-Ray Movie” activity (turn on blu-ray player, switch AV receiver source)? If that’s the case, I’m not sure why you would call it a Harmony remote app when it’s really a GTV remote app. I currently own a first generation Logitech Harmony remote and I love it!!! I bought the Logitech Revue yesterday and so far, I’m very impressed. I am now using my iPhone to start the Watch Google TV activity which I love. Is there anything in the works to allow me to add other activities such as Play XBOX360 or PS3, etc. to the iPhone app? It would be nice to have just the Revue keyboard and my phone around instead of the Keyboard and another Harmony remote just to do everything I normally do in a day. Without more activities available, this is hardly a true “Harmony Remote” because I have to switch the inputs on both my TV and AVR manually on my phone to do anything other than watch Google TV. Thanks for your help. Long time Logitech harmony remote user. However looking for a replacement for Harmony 1000/1100 which I’ve owned since they came out, since touch screen on these devices are sub par and outdated technology. Most annoying. I thought when first reading the advertising as “Harmony remote app for iphone/android”, that my prayers have been answered however obviously they were not. This is merely for the logitech revue and does not allow for creating other activities. Disconcerting really. I cannot believe an App which uses the current IR blasters and maybe an adapter for wireless transmission to IR blaster if required or new hardware IR blasters. I would gladly pay for either. I have been putting off buying competing company’s hardware/software apps for iphone/android to use as universal remote because I like the logitech harmony software so much. But now am considering going with the competition as I have been waiting for months even after the competition came out with comparable apps/hardware. You are correct that our Logitech Harmony apps are designed to work currently with Logitech Revue with Google TV. We are constantly working on improving and expanding our Harmony line of products – across hardware, software and apps – and feedback from customers like yourself plays a big role in that. I appreciate you taking the time to write to us and assure you that we are listening. Would love to see a native iPad app as well. Thanks!